The good news about dental disease is that it can be prevented or treated. This includes both home and veterinary dental care. Veterinarians are committed to educate you about the dental care your cat needs, which can include home teeth brushing, dental diets proven to prevent tartar, in-clinic dental care, including x-rays of the teeth, and oral surgery. Check for reddened gums–this may not look terrible, but this is disease. Periodontal disease starts when plaque and tartar build up on the teeth. The plaque harbors bacteria, which causes gum inflammation and can lead to infection. Dental disease can be very painful. Although some teeth lesions are very obvious, many are not seen in cats without dental x-rays. 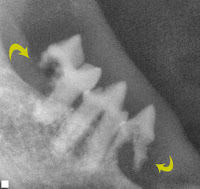 The crown of the tooth is excellent, but dental x-rays show severe disease of the tooth root which is painful. WHO SHOULD PERFORM DENTAL SURGERY ON YOUR CAT? Please ask your veterinarian if they have dental x-rays. Inquire about the dental procedures performed and who will be performing the procedures. If your veterinarian is not trained or does not have the proper equipment for dental extractions please be asked to be referred to a veterinary dentist or another veterinarian who has more extensive training in dentistry. You may call around for dental quotes and you may find that the price may range but so does the quality of dental care. Please check that your veterinarian has a modern veterinary dental machine, dental x-ray machine and has kept current with dental courses to be qualified to perform dental surgery on your cat. Ask your veterinarian if they perform dental nerve blocks this is important for pain control for your cat when the tooth is extracted. resorption. These lesions were called cat cavities. In some cases, there appears to be a "hole in the tooth" (also shown in photos below). therefore not possible to effectively prevent tooth resorption. Cats are very careful not to demonstrate pain. Signs of pain can be very subtle with these cats. The best treatment for tooth resorption is dental extraction. Unfortunately this is easier stated than performed. These teeth are fragile and usually fracture during extraction. Dental radiographs are essential for extracting these teeth because they help the operator find fractured root fragments. The entire tooth should be removed to avoid infection or other problems. 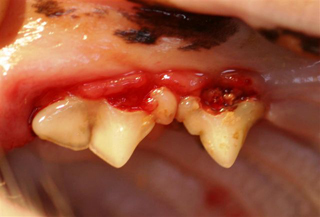 Periodontal disease is one of the most common oral problems identified in cats. 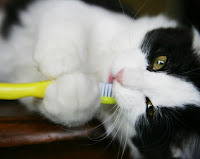 Periodontal disease in cats, just like in humans and dogs is caused by the bacteria in plaque. Left on the tooth surface plaque becomes mineralized by calcium salts in saliva. This mineralized debris called calculus or tartar, provides a rough surface for more plaque to adhere. The bacteria in the plaque begin to change to a more virulent form and infect the gums and connective tissue around the teeth. - The infection eventually invades the bone holding the tooth in the mouth. - Eventually the tooth will become loose and fall out, the body’s way of healing the disease. - This process may take weeks to months causing severe pain and discomfort to the cat. In addition, bacteria may enter the blood stream and cause damage to heart valves, liver and kidneys. Cats with periodontal disease may also have concurrent problems like tooth resorption and tooth fractures. Full mouth dental x-rays are indicated for every cat with periodontal disease. Please have your cats teeth checked yearly by your veterinarian and discuss the options to keep your cat’s mouth healthy! Dr. Melanie Bonder is the owner and veterinarian at the Downtown Toronto Cat Clinic.